Bret Moldenhauer applies a cup to Jesslynn Stockard, a University of Tennessee at Chattanooga softball player who had vertebrae compression in her lower back that caused nerve pain in both legs. When an accidental fall into a doorknob required John Althoff to have shoulder surgery, his recovery included physical therapy to increase his range of motion in that arm. But then he needed therapy to tolerate physical therapy. "I'm five weeks out of surgery, but I feel pain in the shoulder joint. I can raise my arm, but it hurts when I do," he says. With physical therapy twice weekly, Althoff sought pain relief. So he turned to Bret Moldenhauer, a licensed acupuncturist, for cupping therapy. Moldenhauer is owner, founder and practitioner of Institute for Acupuncture and Wellness, located in Erlanger North Annex in Red Bank. He explains that cupping involves creating a vacuum by suctioning air out of a round, glass cup with heat, placing the cup on the affected area, drawing blood to the surface of the skin while pulling the skin upward to enhance circulation, reduce inflammation and pull out toxins lingering in tissues. It can also be combined with acupuncture in which needles are inserted in the skin over which the cup is attached. For Althoff, cupping was intended to increase blood circulation to an area where scar tissue was forming as well as relax muscles in order to give him better range of motion for physical therapy. "It loosened up the shoulder blade and main muscle that operates from the tip of the shoulder across the top of the shoulder blade," says Althoff. "Before it hurt when I raised my arm; afterward, it didn't hurt as much." Cupping came to national attention after photos of large, red rings on the shoulders of swimmer Michael Phelps appeared during the Summer Olympics in Rio de Janeiro, Brazil. What people first joked were hickeys were actually the telltale circles left after cupping. "Cupping with Michael Phelps got huge press," says Moldenhauer. While people thought Phelps' treatment was something new, it's actually thousands of years old, an ancient form of alternative medicine first done by the Chinese using hollowed animal horns. Today's techniques are certainly more advanced, but the original philosophy is the same. Cupping is effective in reducing joint or lower-back pain, rheumatoid arthritis pain, relaxing muscles to ease migraines and treating respiratory conditions, says Moldenhauer. Some online studies have even found it effective in treating acne since it improves blood flow and helps lower skin inflammation. 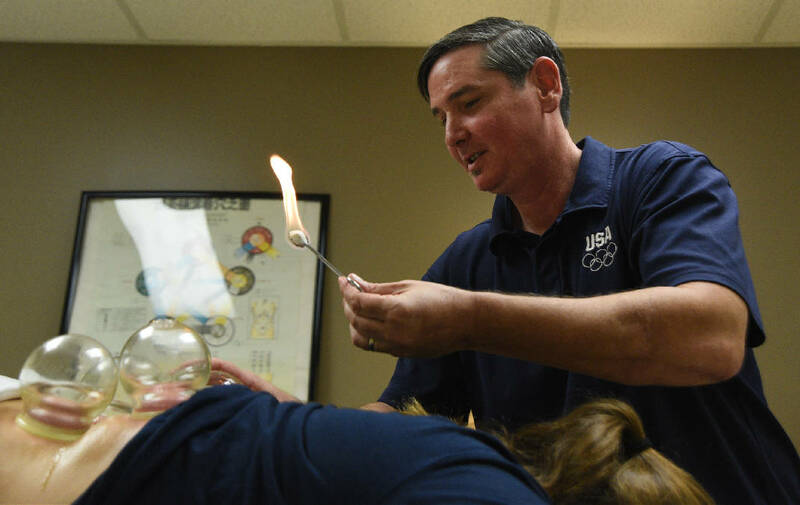 Dr. Jeffrey Jump, medical director at CHI Memorial Integrative Medicine Associates, says "there's not much in the way of scientific study" to document with certainty how successful cupping is or for what problems. "That's the way Chinese medicine can be viewed: through the lens of Chinese medicine or the lens of Western medicine and our ideas of health and disease," says Jump. "From a purely Western standpoint, cupping probably works on fascia tissue, the connective tissue that surrounds muscles. Cupping can help alleviate soreness in big muscle groups like the shoulder and back." A 2014 study by the Journal of Traditional Chinese Medical Sciences, which examined the results from 16 studies of cupping's effectiveness, said the treatment may have a short-term effect on reducing pain when compared to using heat or drugs or no treatment at all. A 2012 report from Australian and Chinese researchers, who reviewed 135 studies on cupping, said it may work if patients also use acupuncture or drugs as part of their therapy. Moldenhauer begins his session with Althoff, a retired UPS driver, by asking where he feels pain and what his doctor or therapist has told him. In a soothing voice, he compassionately acknowledges Althoff's frustration over loss of motion. After determining the area to be cupped, Moldenhauer smooths the skin with olive oil, which allows rolling — or cupping that moves — and helps protect skin from irritation. For Althoff, a fixed cupping was done, meaning the cups remained stationary after placement. Cups range in size from a 2-1/2-inch diameter to about 4 inches. Smaller cups are used to treat issues such as tennis elbow and joint pain from rheumatoid arthritis. Larger cups might be used on glutes or anywhere on the back. To start Althoff's treatment, Moldenhauer dips a cotton ball clamped in hemostats into 91 percent alcohol. After swirling the ball completely around the inside of a glass cup, he lights it. "The alcohol is to create a vacuum by fire," he explains. The flaming cotton is inserted into the glass cup with a swift in-and-out motion — quick as the blink of an eye. The cup is turned upside down and placed in position on the skin, forming a suction seal. Instantly, tissue will rise, sometimes popping right up, into the cup. "Ninety-one percent alcohol has a higher burning point, pulls a harder vacuum," Moldenhauer explains. "A lesser percentage will sit in the cup and won't evaporate." A patient feels no pain, no heat against the skin, just a slight tug from the suction sealing the cup to tissue — comparable to playing with the hose of a vacuum cleaner as a kid. Cups are checked every five minutes to assess when they should be removed. As they sit, a haze forms inside the cup from surface moisture in the skin evaporating. To remove the cups, Moldenhauer slips a finger under the edge to pop the seal. Red, sometimes blue or purple, rings will temporarily be left on the skin. Althoff says the day after his cupping, the rings were a "little sensitive to the touch, but nothing that would cause you to avoid activity or wearing clothing over it." Problems occur when people try cupping at home, says Moldenhauer, an issue that's been further complicated by the release of new cups that are pumped to create suction instead of using a flame. "Suction cups provide you with no feedback as to what is too much pressure, and you can seriously damage and break blood vessels, making the patient worse," he explains. "When cups are left on too long, suction is so powerful it will create huge blood blisters — literally pulling blood through the skin, which has a good chance of infection. They are very hard to heal because blood has been pulled so deep from the muscle it's torn open a channel that is hard to heal."